You may have noticed activated charcoal popping up on your newsfeed and social media channels more often these days. It’s been around for hundreds of years, but has recently blown up in the health and beauty world due to its amazing uses and benefits. From whitening your teeth to soothing your stomach, check out how to use activated charcoal to up your health and beauty game! Activated charcoal is a fine black powder made from coconut shells, peat, coal, wood or other materials that when processed at high heat becomes “activated”. This eliminates any substances and chemicals that can be harmful to humans. When it’s activated, the whole internal structure also changes and makes it more porous than regular charcoal. It’s able to trap and bind to toxins and chemicals in the body, flushing them so the body doesn’t re-absorb them. There are plenty of benefits of using activated charcoal. Activated charcoal has a negative electrical charge, which attracts positively charged molecules, and this includes toxins and gases, causing them to be absorbed by the charcoal. It binds to toxins and chemicals in the gut, preventing them from being absorbed. Charcoal also traps free radicals and unwanted substances. It can’t actually be absorbed by the human body so it eliminates toxins through excretions. What are the Risks of Using Activated Charcoal? Although there are tons of activated charcoal benefits, there are also some risks. Activated charcoal binds to harmful substances in your body, but it can also bind to good substances like vitamins and nutrients, as well as prescription medications. This prevents them from getting into your bloodstream. Although activated charcoal is known for its teeth whitening benefits, it can also damage your enamel if you’re not careful. The abrasiveness of the mineral can cause damage if it’s scrubbed against your teeth, so make sure to graze lightly when you’re applying it to your teeth. While in some cases activated charcoal can help soothe your stomach, it’s also important to keep in mind that it can trigger constipation and slow the process of food and waste through the digestive system. Each individual is different, so you have to figure out what dosage is best for you if you’re consuming it. Where Can You Buy Activated Charcoal? You can buy activated charcoal online. Here are some of our favorites! Activated charcoal has blown up in the health and beauty world due to the fact that it’s all-natural and has so many good-for-you benefits. 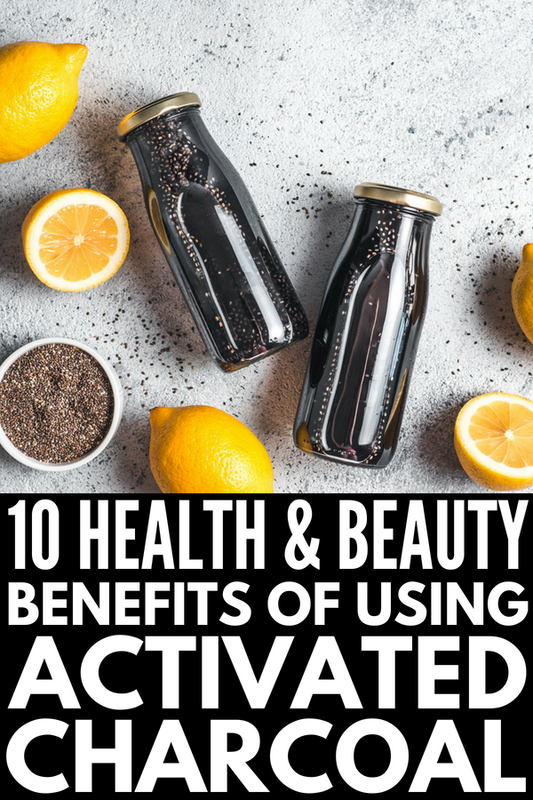 Here are 10 ways to use activated charcoal for health and beauty. Activated charcoal is an amazing ingredient to use in a face mask as it pulls dirt out of your pores, releasing toxins from your skin. Oil and dirt make your pores look bigger, so removing these things leaves you with fresher, less oily skin. To make a face mask, you’ll need activated charcoal powder and a few drops of water to create a paste. Apply to your entire face and let it sit for ten minutes. Remove the mask with warm water and a cloth! Activated charcoal has recently exploded in the world of teeth whitening. It absorbs plaque and other teeth-staining compounds to keep your smile pearly white. Just remember not to rub too hard to avoid damaging your enamel. Activated charcoal attracts toxins and chemicals away from your skin, leading to a skin detox. It can help clear out your pores and reduce excess oils that can lead to acne. It helps prevent acne outbreaks and won’t harm your skin like some other acne cleansers out there. If you experience nausea, or worse, the stomach flu, activated charcoal could be the remedy you’ve been searching for. It’s thought to absorb the bacteria that causes the stomach flu, eliminating it from your system. You can take 500 to 1,000 mg two to three times per day, mixing the powder with some applesauce. Activated charcoal pills aren’t something you need to take every day. They can help you detox your body, reduce cholesterol and boost anti-aging, but it’s still only recommended for short-term use. Also, ensure you don’t take them at the same time as other nutritional supplements. The theory is that if they can magnetize the bad, they can also eliminate the good. Making your own natural homemade food dyes is ideal, especially if you have kids and don’t want them consuming too many processed foods. To get the best black coloring for your natural food dye, mix activated charcoal powder, black cocoa powder and squid ink. A black charcoal smoothie may be the most striking smoothie you’ve ever seen. Mix it with ingredients like chia seeds, almond milk, banana, blueberries and peanut butter for a delicious and healthy morning drink. The activated charcoal will help detox your body and feel healthy all day long. Since activated charcoal removes toxins, it can help relieve ear infections in two ways. You can combine the activated charcoal with water, creating a poultice and put a couple of drops in the ears. You can also put the activated charcoal directly in the ears (lay on your side to make it easier to place it in). Note that your ears will likely be black for a few days. Activated charcoal tablets have pain relieving properties that can help soothe a sore throat. They can be used as a lozenge, providing you with more relief than an ordinary cough drop! Activated charcoal alleviates gas and bloating by binding gas-causing byproducts in foods that cause discomfort. You can take activated charcoal in a pill, liquid or powder form for stomach discomfort. Tablet form is typically best and make sure to drink lots of water to avoid constipation. Always make sure to check the bottle to follow their directions, but often it’s suggested to take a 500 mg tablet with a big glass of water an hour before a gas-producing meal. Activated charcoal has many uses and benefits, especially in the health and beauty realm. Use these tips to feel good and look good with activated charcoal! If you loved this post on how to use activated charcoal, please share it on Pinterest! And if you want more health tips and tricks, please follow our Health Board on Pinterest!